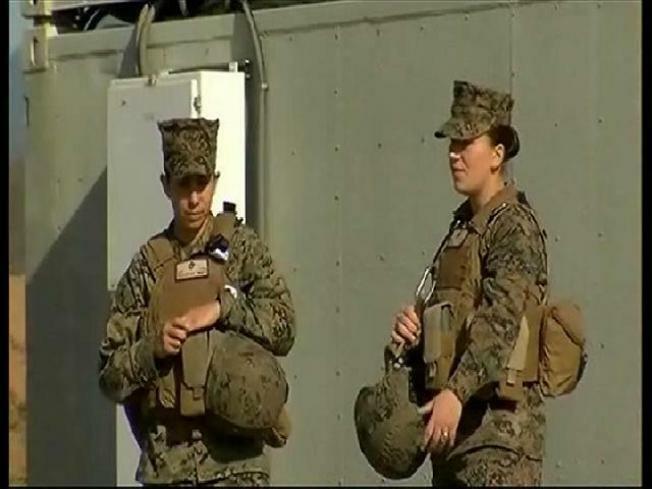 Defense Secretary Leon Panetta, in lifting a ban on women serving in combat, said women have become integral to the military's success and have shown they are willing to fight and die alongside their male counterparts. "The time has come for our policies to recognize that reality," Panetta said Thursday at a Pentagon news conference with Gen. Martin E. Dempsey, chairman of the Joint Chiefs of Staff. "Not everyone is going to be able to be a combat soldier but everyone is entitled to a chance," Panetta said. He said the qualifications will not be lowered, and with women playing a broader role, the military will be strengthened. Panetta said that his visits to Afghanistan and Iraq to see U.S. forces in action demonstrated to him that women should have a chance to perform combat duties if they wish, and if they can meet the qualifications. "Our military is more capable, and our force is more powerful, when we use all of the great diverse strengths of the American people," Panetta said earlier Thursday at a Pentagon ceremony in remembrance of Martin Luther King Jr.
Panetta is expected to step down as Pentagon chief sometime in February. Republican Former Sen. Chuck Hagel of Nebraska has been nominated as his successor, and his Senate confirmation hearing is scheduled for Jan. 31. "Every person in today's military has made a solemn commitment to fight, and if necessary to die, for our nation's defense," he said. "We owe it to them to allow them to pursue every avenue of military service for which they are fully prepared and qualified. Their career success and their specific opportunities should be based solely on their ability to successfully carry out an assigned mission. Everyone deserves that chance." The decision to lift the ban on women serving in combat presents a daunting challenge to top military leaders who now will have to decide which, if any, jobs they believe should be open only to men. Panetta planned to announce at a Pentagon news conference that more than 230,000 battlefront posts — many in Army and Marine infantry units and in potentially elite commando jobs — are now open to women. It will be up to the military service chiefs to recommend and defend whether women should be excluded from any of those more demanding and deadly positions, such as Navy SEALs or the Army's Delta Force. The change won't take place overnight: Service chiefs will have to develop plans for allowing women to seek the combat positions, a senior military official said. Some jobs may open as soon as this year, while assessments for others, such as special operations forces, may take longer. The services will have until January 2016 to make a case to that some positions should remain closed to women. Officials briefed The Associated Press on the changes Wednesday on condition of anonymity so they could speak ahead of the official announcement. But as news of Panetta's expected order got out, many members of Congress, including the Senate Armed Services Committee chairman, Sen. Carl Levin, D-Mich., announced their support. "It reflects the reality of 21st century military operations," Levin said. Objections were few. Jerry Boykin, executive vice president of the Family Research Council, called the move "another social experiment" that will place unnecessary burdens on military commanders. "While their focus must remain on winning the battles and protecting their troops, they will now have the distraction of having to provide some separation of the genders during fast-moving and deadly situations," said Boykin, a retired Army lieutenant general. He noted that small units often are in sustained combat for extended periods of time under primal living conditions with no privacy. Panetta's move comes in his final weeks as Pentagon chief and just days after President Barack Obama's inaugural speech in which he spoke passionately about equal rights for all. The new order expands the department's action of nearly a year ago to open about 14,500 combat positions to women, nearly all of them in the Army. In addition to questions of strength and performance, there also have been suggestions that the American public would not tolerate large numbers of women being killed in war. The necessities of combat in Iraq and Afghanistan, however, propelled women into jobs as medics, military police and intelligence officers that were sometimes attached — but not formally assigned — to battalions. So while a woman couldn't be assigned as an infantryman in a battalion going out on patrol, she could fly the helicopter supporting the unit, or move in to provide medical aid if troops were injured. And these conflicts, where battlefield lines are blurred and insurgents can lurk around every corner, have made it almost impossible to keep women clear of combat. Still, as recent surveys and experiences have shown, it will not be an easy transition. When the Marine Corps sought women to go through its tough infantry course last year, two volunteered, and both failed to complete the course. And there may not be a wide clamoring from women for the more intense, dangerous and difficult jobs, including some infantry and commando positions. Two lawsuits were filed last year challenging the Pentagon's ban on women serving in combat, adding pressure on officials to overturn the policy. And the military services have been studying the issue and surveying their forces to determine how it may affect performance and morale. The Joint Chiefs have been meeting regularly on the matter, and they unanimously agreed to send the recommendation to Panetta earlier this month. A senior military official familiar with the discussions said the chiefs laid out three main principles to guide them as they move through the process. Those were to maintain America's effective fighting force, preserve military readiness and develop a process that would give all service members the best chance to succeed.